Coffee-Counter Culture – James Proclaims! I’ve always been more of a coffee drinker than a tea drinker, which perhaps defies the British stereotype. It’s not uncommon though, and truthfully I’m not anti-tea or anything; I like tea too, I just prefer coffee. I’ve drunk coffee for as long as I can recall; certainly my habit began in primary school. If anything my parents encouraged it, but you have to remember it was the eighties back then and they were preparing me for life as a yuppie. It started out as instant coffee, bog-standard instant coffee at that, but as I got older my tastes became more refined and I went from Nescafe (or supermarket own-brand equivalent) to Nescafe Gold (or supermarket own-brand equivalent). Nowadays, if I have to drink instant at all, I’m very much a Kenco Millicano man (or supermarket own-brand equivalent), but really I much prefer ‘real coffee’. My wife bought me a coffee machine for my birthday last month and it’s been in constant use ever since. I wouldn’t say I’m a coffee connoisseur, because that would imply some sort of knowledge and expertise on the subject, but I am increasingly a coffee snob. I also like availing myself of an ‘Americano’ from the various coffee outlets in Reading town centre en route to work of a morning. I have noticed there is something of a disparity in both price and quality. There are several venders who profess to sell the best coffee in Reading. It can’t be true for all of them but they do charge significantly more than those who don’t make such outlandish claims. I think it’s entirely possible to pick up a fairly decent sized cup of coffee for around a £1 -£1.50. At that price it’s a little morning luxury. However one retailer recently charged me £2.90 for what was admittedly a very high quality product. But it wasn’t so good that it was worth two cups of coffee from its neighbouring competitors. Plus the £2.90 coffee was served with a cocky swagger by an overconfident youth who thinks the job title ‘barista’ actually means more than just being the Italian word for someone who works in a coffee shop. There’s nothing wrong with working in a coffee shop but don’t oversell it. It’s probably something his mum constantly has to deal with. The £1.20 I paid for what was actually just instant coffee from a kiosk in a town centre park a few weeks ago seems equally offensive on reflection. Because that’s a 40p cup of coffee at best. It’s a lovely park too, but I’ll be importing my coffee from now on. Last word goes to the behemoth that is Costa Coffee. I don’t tend to frequent the high street giants like the afore-mentioned Costa or Starbucks – I’m pretentious enough to prefer my coffee to be ‘indie’, but occasionally needs must. In these places the ‘baristas’ are encouraged to upsell you from a small to a medium. It’s a trap I’ve fallen into numerous times. “Would you like a large or just a medium?” is the loaded question they ask. Sometimes I remember that there is a third, cheaper, option. Sometimes I go with the medium, which is inevitably larger than I need. For some reason the other day I decided to go for a large. It was first thing in the morning so my faculties hadn’t all kicked in and it was post my £2.90 experience so in the context of that, the £2.40 that Costa were charging didn’t seem too bad. I was presented with this monstrosity. The last time I needed a two handled cup, even my liberal-minded parents thought I was too young for coffee. I absolutely love this post! Your writing style is great and reflects your humorous personality. I myself am an amateur coffee snob and I’d love to do a collaboration post about the love of coffee if you’d be willing, or at least have the permission to reblog this post and use it for a story. Great job on your post and the set up of your site as a whole. You absolutely have permission to reblog this! And always open to the idea of collaborating. Could be fun! Especially enjoyed: Plus the £2.90 coffee was served with a cocky swagger by an overconfident youth who thinks the job title ‘barista’ actually means more than just being the Italian word for someone who works in a coffee shop. Thanks for the comment – always nice to get positive feedback! I’ll check out your blog now. Pingback: An Infusiasm For Tea | James Proclaims! Hi. I’ve popped over from Peg-O-Leg’s post about avatars – I came to see your upgrade! I like the sketchy expressions in the suns – works for me 🙂 I’ve accidentally become a Coffee snob too. I remember when I first encountered the places and didn’t realise a double shot came as standard, and I thought it was bleugh – now I can’t have anything less. I used to have a cappuccino…… now I blithely order “double shot Americano with hot milk on the side”. I stopped going to Starbucks because of its insipid coffee – way before their ethics came into question. 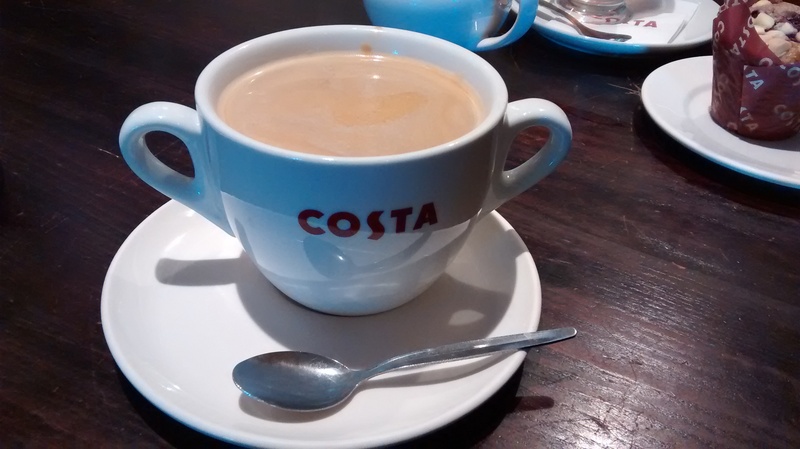 Yup, you have to watch Costa – even I don’t want a soup bowl of coffee!! Thanks for stopping by, following me and making a pretty awesome comment to boot. You’re my kind of blogger and I’m following you right back! You’re very welcome 🙂 I see you’ve been doing some quick reading yourself! Isn’t serendipity a great thing! It is indeed and I’m already a fan of your work! I really enjoyed this post, being a self-confessed coffee snob myself 🙂 Your wit and writing style is very entertaining, thank you! Melbourne is the coffee capital of the world (sorry, Rome), and full of coffee snobs (I am one of them), but anyone who charges more than $4AUD for a “regular sized” here is too expensive. I wouldn’t go back to them, because there is enough competition here to get a great coffee for $3.50AUD. My regular brew (for $3.50!) is a double-ristretto cappuccino, if you can believe it – I know it sounds pretentious but my regular barista recommended it & I love it!